A visit to the Garden Island of Kaua’i can turn expensive very quickly. Put together a stay at one of the many resorts, a car rental, lots of restaurant meals, $10 gallons of milk, and an expensive activity or a luau, and suddenly you’re talking real money, and that’s on top of what you spent on airfare to get over here. A visit to Kaua’i should not be a last minute decision if you want to save. I cannot stress this enough! You’ll pay more for everything at the last minute. Schedule your trip several months in advance to look for the best bargains and save the most. Avoid the peak tourist seasons: These are winter break (this starts around the second week of December until just after New Year’s Day); summer (mid-May through Labor Day); and mid-March to mid-April (spring break time). Unless lodging is booked early, it can be difficult to find affordable choices, especially in your preferred location. Prices are usually higher during the peak season anyway. Start looking for airfares early. Airfare to Lihue will be your biggest expense, but if you don’t have miles to redeem, there are some terrific deals to be found if you start looking early enough. I checked prices on Kayak last weekend and found roundtrip economy airfares for the week of April 19 – 26 (nonstop to Lihue from Seattle) starting at just $374 (just after spring break). Come during the heavier tourist seasons, or wait to book until the last minute and the price of that same flight would more likely be $750-$850 (at a minimum). This cute studio rental in Princeville is just $99 a night, much, much less than you’d pay for a room at a hotel or resort. Once you have your flights nailed down, then look for lodging. If you don’t have hotel points to use, and you want to save on lodging, do not even think of booking at a hotel or resort! 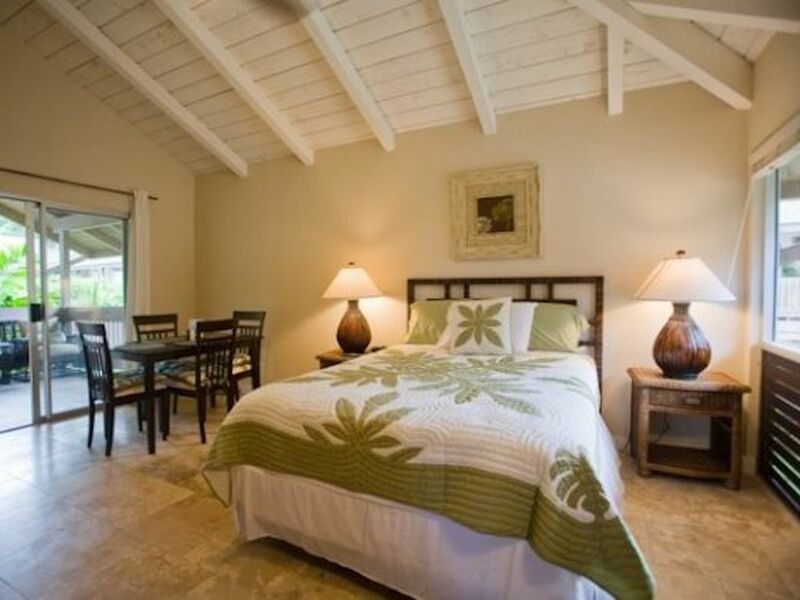 I strongly suggest checking what’s available on VRBO – I found this rental in pricy Princeville on the north shore for $98/night (it sleeps four and has a washing machine), or this one for $85/night, or this one for $99/night, and there are others similarly priced in other areas of the island for much less than the room rate at any hotel or resort (and, these are summer prices!). The only thing that might cost less per night is a bunk in one of the hostels. Even a VRBO studio rental will have a microwave and other cooking options to boost savings. There are several local vacation rental agencies, but I’ve found their prices to be higher than what you can find on VRBO. Craigslist also advertises vacation rentals, but buyer beware – not all are legit. If you don’t have a Costco membership, get one. You’ll save more than the $55 membership fee on your car rental as well as on food and gas by shopping at Costco. I searched Costco’s travel site for that same week in April that I was checking airfares, and found an intermediate size car (think Camry or Accord) for seven days from Budget for just $276 on Costco’s travel site – and that’s the full price, including tax. Gasoline out in town right now is around $3.55 per gallon but at Costco it’s $3.09. Costco here is also located near the airport so it’s easy to fill your tank right before you return your car at the airport. Food prices at Costco are pretty much the same as they are on the mainland (a roast chicken is still $4.99 here too). 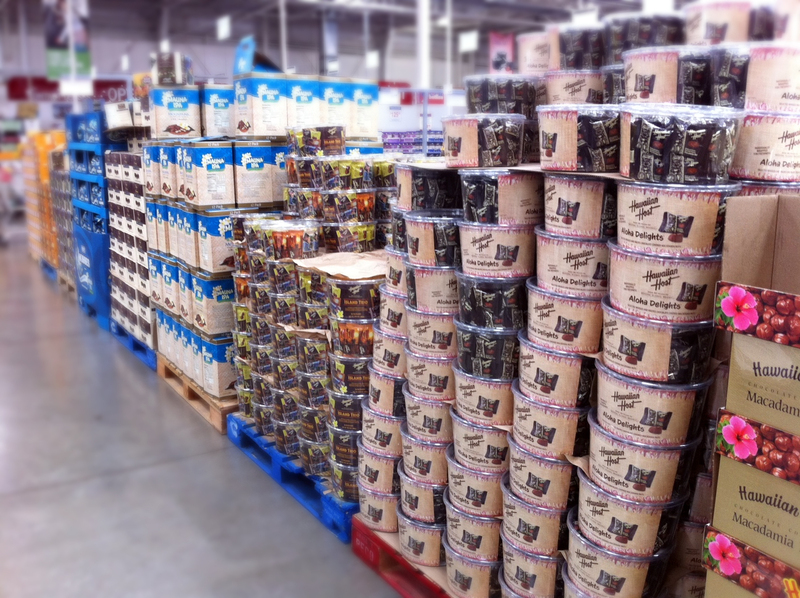 Costco is also the place to find inexpensive Hawaiian snacks and local favorites like poke. Their hot dog meal is $1.50 here as well. Try to eat at least two meals each day at your rental. Stop and get some supplies and fix breakfast in your room, and enjoy a light dinner there too and you’ll save a bundle. Lots of the condos where the inexpensive rentals are located have outdoor grills that guests can use, and you can heat other things in your microwave or on a hotplate, if provided. It’s fun to go out on the town, but you’ll pay much, much more out there for beer, wine or a cocktail. You can save by enjoying drinks on your lanai while watching the sun set. Buy your food where locals do. That means staying out of the Whaler’s Markets or the ABC stores – that’s where you’ll find those $10 gallons of milk – and shop at Costco, or at Big Save for the biggest savings. Foodland will cost you a little more and Safeway is the most expensive supermarket on the island. If you want milk, look for the “expires soon” sticker on the carton – the milk will be half price, and will be OK for a few more days. Also, make a point of going to one of the many farmers’ markets on the island – you can find days and times online – and buy your produce there. Skip the $7 or $8 pineapples though and pick one up at Costco – they’re Hawaiian grown and just $3.99. There are lots of inexpensive places around the island to buy filling, healthy, and delicious lunches (or dinners) for less without having to resort to McDonalds or Taco Bell. For example, there’s Hamura’s saimin (noodles) or the Tip Top Cafe in Lihue for lunch; or Duane’s Ono Charburgers in Anahola (a must stop in my opinion). No.1 in Kapaa might not look like much but they serve decent Chinese food and great hamburgers at good prices. Pono Market in Kapaa Old Town is another local favorite – they sell a variety of take-out items including poke bowls and great plate lunches. Da Crack (killer chicken burritos) or Puka Dog in Poipu (Anthony Bourdain showcased Puka Dog on No Reservations) are both worth checking out on the south shore as is the Sueoka Market snack stand in old Koloa Town for ono, local-style plate lunches. You can get BIG and tasty Hawaiian-style spicy ahi tacos on freshly made tortillas at Island Taco in Waimea, and Shrimp Station (located in both Kapaa and Waimea) serves affordable, out-of-this-world coconut shrimp. Bring along your own bottled water to drink wherever you go. Take advantage of coupons. There are several different free publications you can pick up all over the island that have coupons for local restaurants and activities that can help you save. Snacks don’t have to be expensive either. Locally made products can be found for less at Costco, but a shave ice once in a while is always good. I recommend Wailua Shave Ice in Kapaa, the original JoJo’s in Waimea, or Rainbow Shave Ice in Hanalei. If you can find TegeTege’s trailer – they move around the island – their shave ice is a little more, but is outstanding. A banana frosty (or pineapple frosty, if they’re out of bananas) from Banana Joe’s in Kilauea is a must-try. Also in Kilauea is the Kilauea Bakery & Pau Hana Pizza – their macaroons are to die for, and they also make good sandwiches and soups. The best of Kaua’i is free. 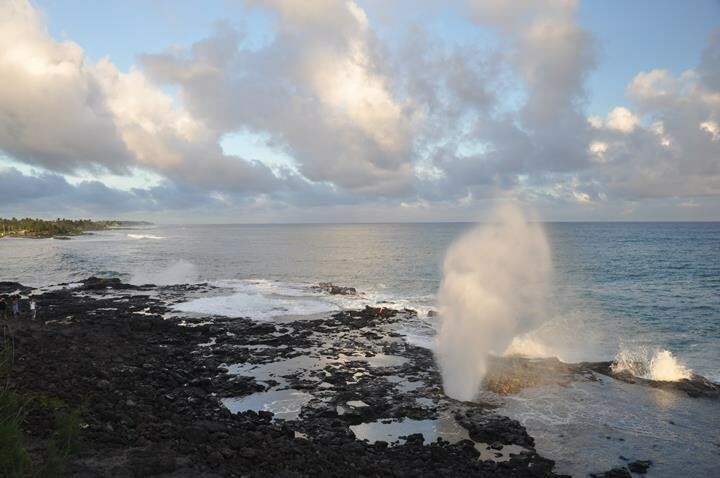 There is so much to see and do on Kaua’i that it might actually feel overwhelming at first. 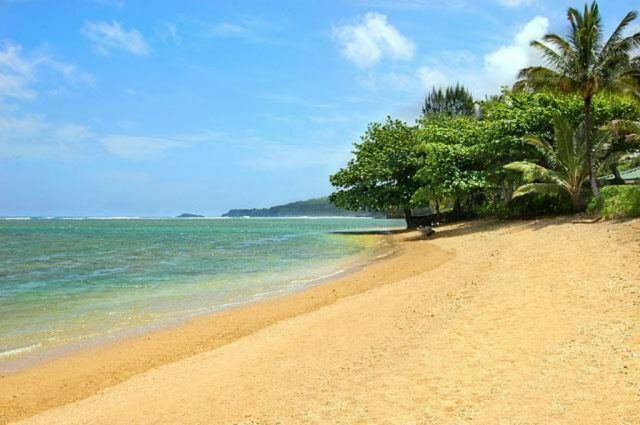 Kauai’s beaches are known for their powdery sand and they’re usually not crowded; in fact, at some you might be the only visitor at a particular beach on the day you visit. You could go to a different beach here every day, each with a different view and experience (remembering to always, always respect the power of the ocean here). It’s the same for the numerous hiking opportunities all over the island, with their spectacular scenery and vistas. 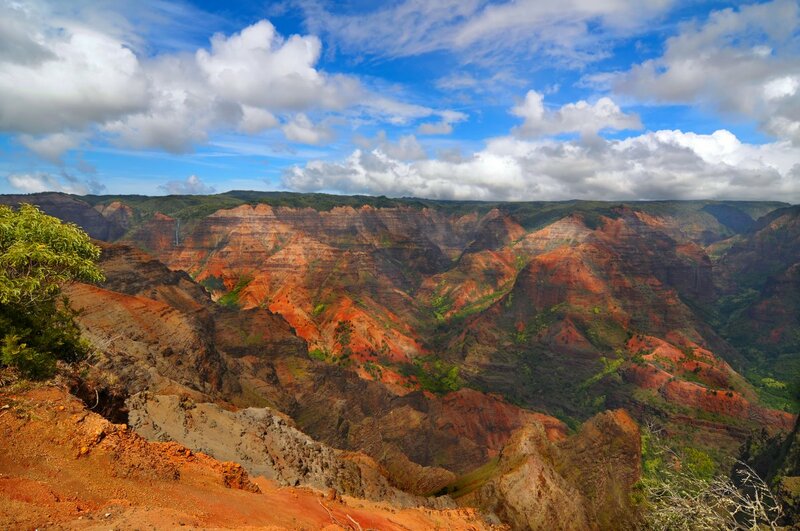 No visit to Kaua’i is complete without visiting the splendor of Waimea Canyon (the “Grand Canyon of the Pacific”) and Kokee State Park. A stop at Spouting Horn in Poipu costs nothing, as will a stroll through Hanalei on the north shore, Old Koloa town on the south shore or Hanapepe on the west side of the island, where you can get a closer look at historic buildings from plantation days and do some window shopping (be sure to take a walk across the swinging bridge if you’re in Hanapepe). History buffs can check out the historic churches and temples located all over the island, or visit and learn the history of the heiau (sacred Hawaiian structures). A beach cruiser can be rented in Kapaa for as little as $10 – $12.50 for three hours for rides along the seven-mile beach path with its glorious views. There’s a small fee (adults 16 and older are $5; under 16 is free; seniors free with National Park pass) to visit the historic Kilauea Lighthouse and Bird Sanctuary but it’s well worth it. And, don’t forget the gorgeous sunrises and sunsets – they’re always free too. With a little research and careful planning, it’s possible have a wonderful, fun-filled time on the island of Kaua’i for a lot less than you might imagine, and create memories to last a lifetime. There are enough ways to save here that you could include a special meal at one of the fabulous restaurants located around the island, or indulge in a special activity like zip-lining, ATV tour, or even a boat ride without blowing your budget or going into debt. E komo mai! Thank you — I have visited Kauai many times in the past (it is my favorite Hawaiian island and I have visited all except Nihau and Lanai) and I think I have done virtually all of these things. When my children were small we would take them to Costco to eat lunch at the outdoor foodcourt on every visit. And when they were small we always took them to Lydgate Park both to swim in the protected area and to play on the play structure. We always shop at Costco and the farmers’ markets. We take advantage of the local items sold at Costco and when the kids were small we bought lots of POG as a treat for them. We always eat at Haimura’s. We always get ice cream at Lapperts and shave ice at Jojo’s. We cook 90% of our meals in and pack picnics for lunches. We spend our time at the beach and also hiking and exploring. We let the kids buy souvenirs at the Spouting Horn outdoor market. We have splurged a couple of times on luaus but no need to do that again. We go to Mass at the lovely Catholic Church in Poipu (St. Raphael). As you say, the best things to do in Hawaii really are free! Thanks, Tracy – you’ve got some great saving tips in your comment. Our daughters bought souvenirs at the Spouting Horn outdoor market too the first time we came to Kaua’i (small purses in Hawaiian prints) – they were fun and affordable, and one of them is still being used! We love Lydgate Beach park – before we moved it was the closest beach so we spent most of our “beach time” there (Kealia is closest now). The first time we went to Lydgate I thought it was something that Disney could have created. The best things here really are free – you don’t have to spend much at all to have a wonderful time. Thank you, Laura, for sharing your great tips. 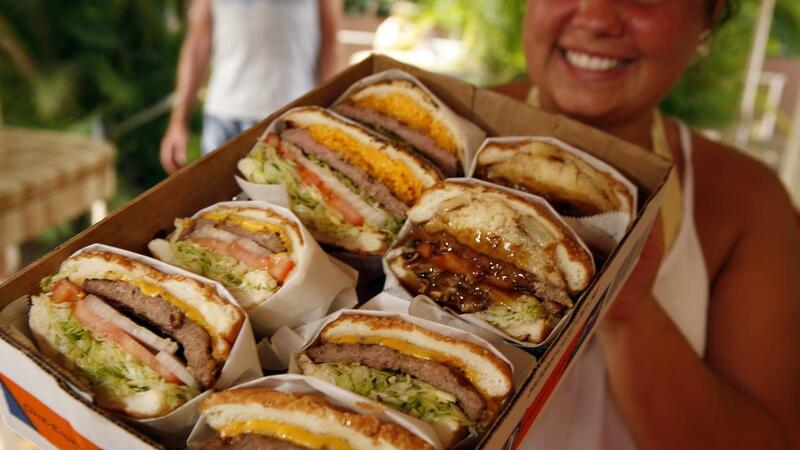 When I visit Kaua’i, it’ll be for the natural scenery and the local food. There is more than enough beautiful scenery and a lot of really tasty, affordable local food here to fill a week or more without ever getting bored. It’s actually almost overwhelming – we’ve been here for almost four years and there is still lots we haven’t done! And there are a lot of them on Kaua’i! You can spend a fortune here if you want, but I love that you don’t have to to have a great time and a quality vacation. I loved your post! I visited Kauai last April and I did several of your tips myself. We went for a friends wedding and made it our second honeymoon so we treated ourselves to a beachfront hotel suite. I did however save on food as all breakfasts were included in our hotel package and we used gift cards to pay for food at the airport during our layover. Sounds wonderful! If you’re able to splurge this sounds like a great way to do. But, even if you can’t afford a splurge there are still lots of ways to save and have a wonderful, memorable vacation on Kaua’i than many might imagine. Yes we saved for over a year for that trip, and I worked extra shifts just to be able to do what we wanted. We cut down on a lot of other things in our day to day lives as well. This sounds like exactly like what we do – save like crazy for a year before we go so that we can do the things we want without crushing the budget or going into debt. This is going into our future Kaua’i file for our next visit. What a great resource. Thanks, Bob! I know Betty is an accomplished photographer, and there are some places I can recommend that are worth visiting and are great for picture taking. Let me know if you have any questions before you go, and I’ll do my best, no matter where in the world we may be at the time!